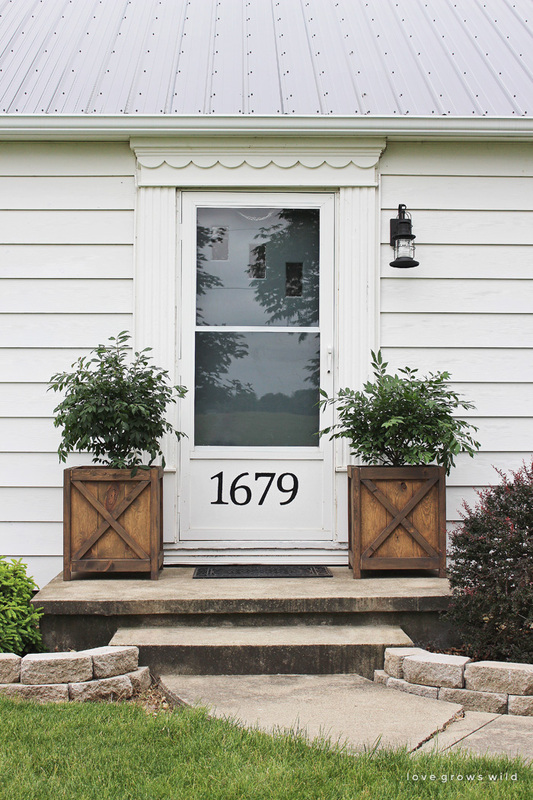 Curb appeal, character, and tons of charm… see how we transformed our farmhouse front porch with DIY wood planters, a lantern light fixture, and bold house numbers! Flat, white, and boring with an outdated light fixture, ugly storm door, no flowers, and a major lack of curb appeal. And then out of the blue one day, inspiration hit me like a ton of bricks! 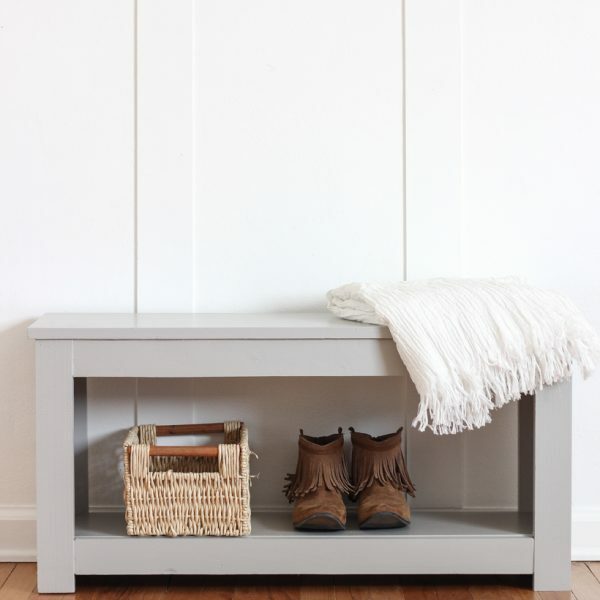 I remembered a photo I pinned that had gorgeous wood planters on the front porch, and I decided that was exactly what we needed to warm up all the white and concrete on our house. 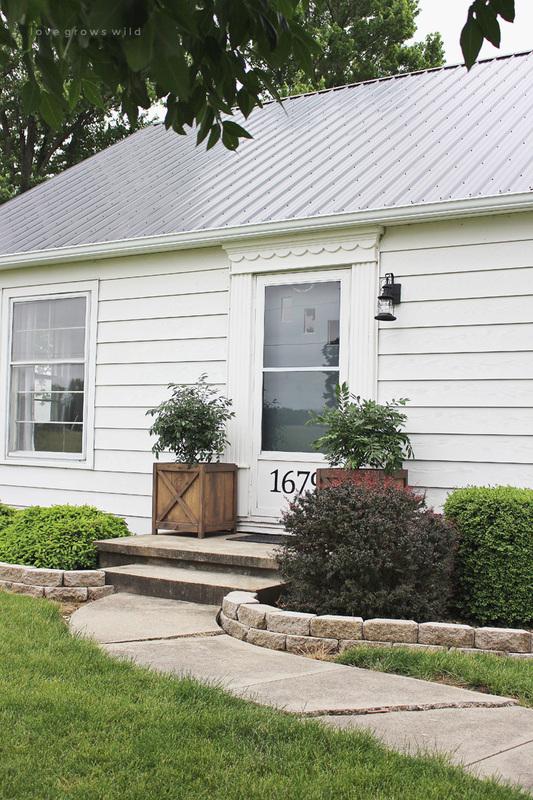 I followed plans from Centsational Girl (which were inspired by Ana White’s version) to build the planters, and I cannot believe how much warmth, depth, and character they added to our house! The “X” design on the front panel really draws your eye in, and I love the large scale of the planters. No tiny, sad flower pots on our porch anymore! A few notes about building the planters: I really like the design of them, but found that the slim 2 x 2’s couldn’t handle so many pocket holes to attach all the panels (the 2 x 2’s kept splitting when I added the screws), so I switched to only using 1 pocket hole on the top and 1 pocket hole on the bottom of the panel (the plans show to use 2 per top and bottom). I also tried to stagger them so they weren’t going into the 2 x 2 in the same spot from both sides. 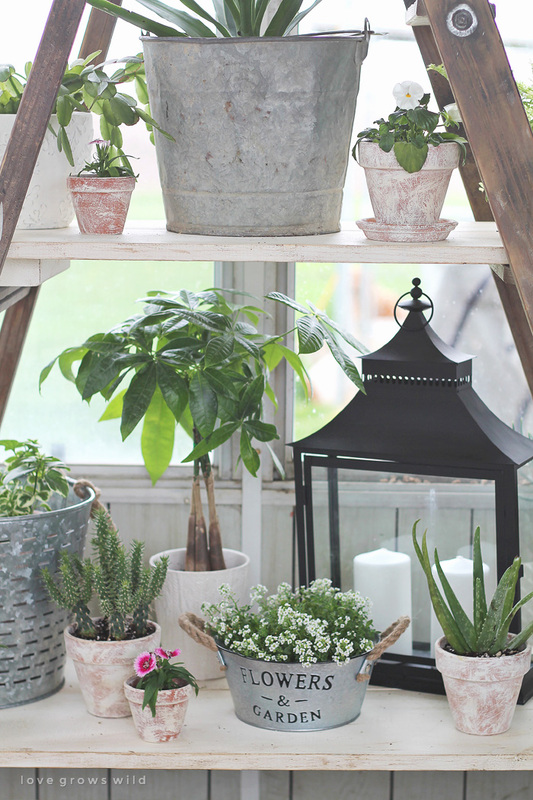 There’s a little “shelf” added to the inside of the planters (see Ana’s plans for details) so that you can place a potted plant on the shelf instead of filling that entire planter up with dirt. Saves a ton of mess and money! I picked two burning bushes to put in my planters for now because I love how big and pretty their leaves are. If we didn’t already have boxwoods along the front of our house, I would have used them. And because these planters are wood and will be sitting out in the elements, I finished them with a semi-transparent exterior stain from Cabot in the color Spanish Moss. 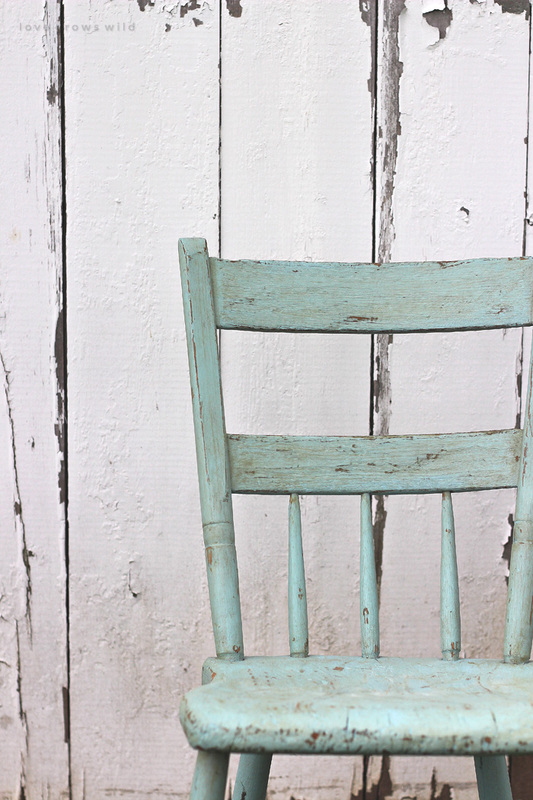 I used this stain on my outdoor bench last year, and the finish has held up beautifully! Some of the products I’m sharing in this post have affiliate links… thank you so much for helping support this blog! I swapped out our old light fixture for a lantern light, which I think adds so much more personality to our front door. 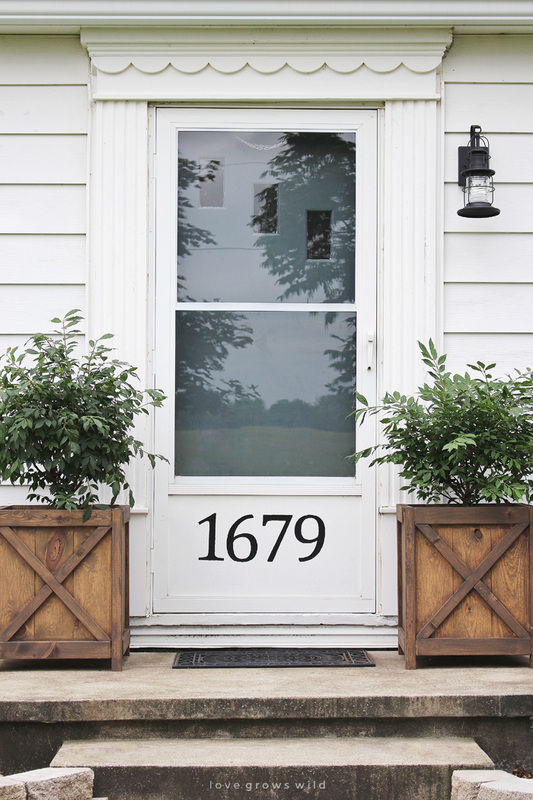 And as much as I would love to remove the storm door to show off the gorgeous old door hiding behind it, I know that’s not the most practical thing to do… function wins over fashion in that battle. So instead of loathing the ugly storm door, I decided to embrace it! 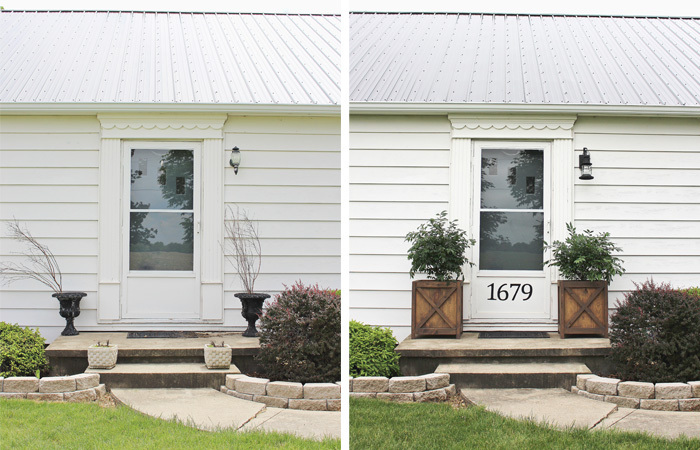 I gave the bottom of the door a bold, graphic element by painting large-scale house numbers using a handmade stencil and some black exterior paint. I decided not to go with a fancy stencil made on my Silhouette machine for this project just so I could show you guys the simplicity of using tools you already have on hand. I printed the numbers on regular computer paper from Microsoft Word, cut the numbers out with scissors, taped them onto the door, and traced around them with a pencil. Then I removed the paper and tape and carefully painted inside the lines with a small paint brush. 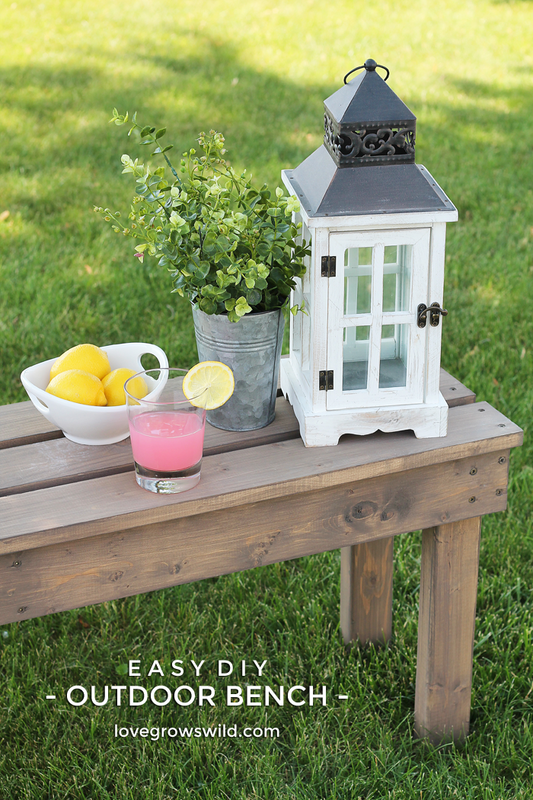 This super simple 30 minute project gave our little front porch SO much character! The black numbers tie in with the light fixture, black metal roof, and black rubber mat that sits in front of the door. 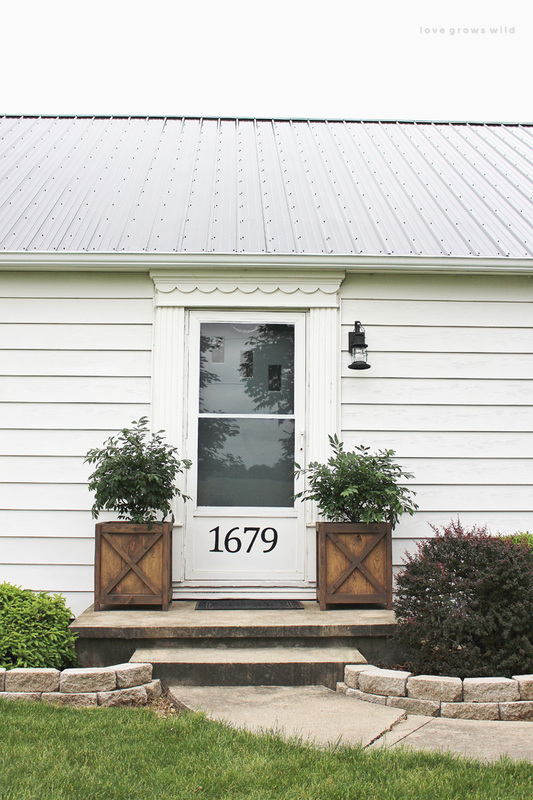 And can we just talk about that scallop detail above the door… it’s one of the many things I just love about our house! 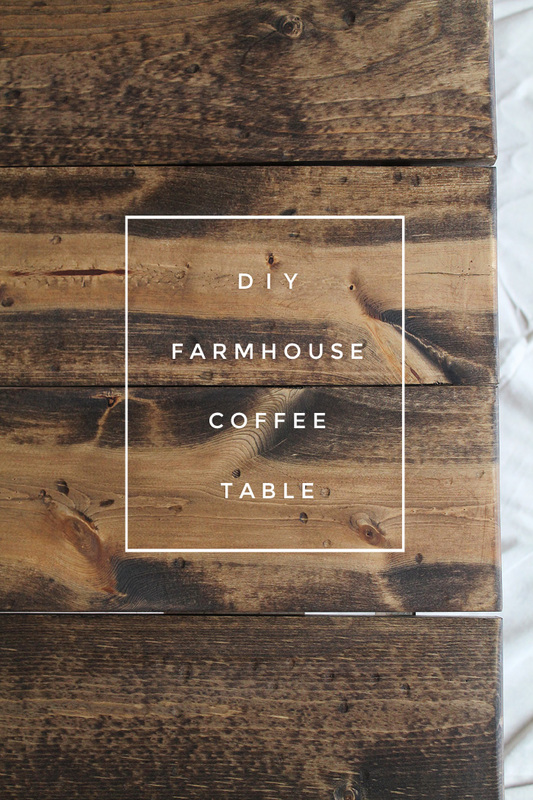 Welcome to our farmhouse, friends! Now it’s YOUR turn to share! What do you think of the makeover? 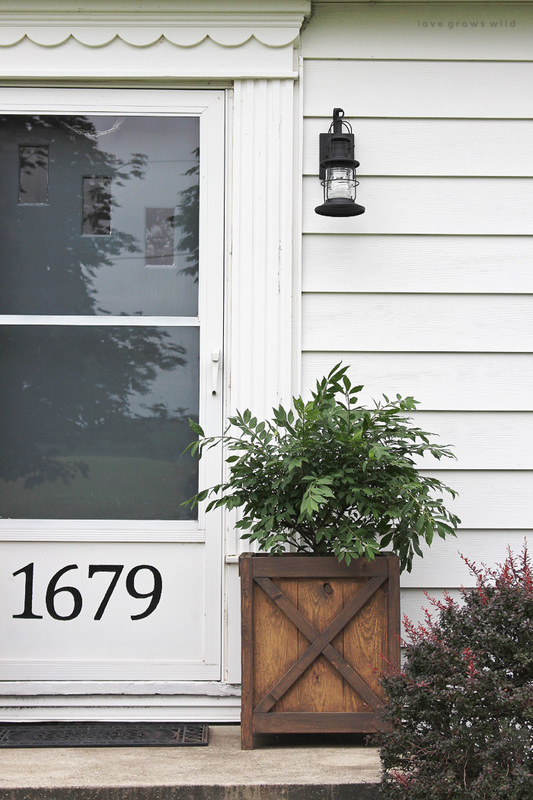 Do you like the planters, light fixture, and house numbers? I’d love to know what color YOUR front door is! Leave a comment for me below! A few changes completely transformed your entry! The planters look amazing. Wow, that is a huge difference! Now I’m all inspired to change the front of our house! We have a bright blue door that is surrounded by pretty red brick. Sometimes I feel like adding to the look would detract from the charm that’s already there, but I also believe that some natural elements like these planters would be amazing. 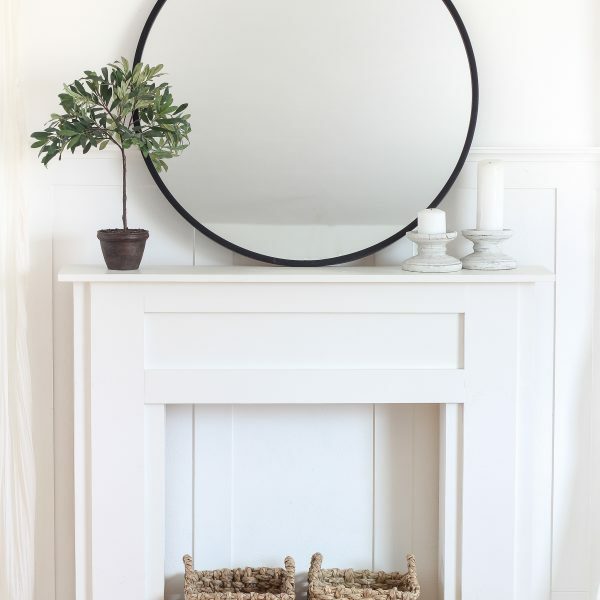 I completely agree, Rebekah… sometimes simple is better to highlight a home’s beautiful features, but wood planters like this might be the perfect little addition! super inviting! 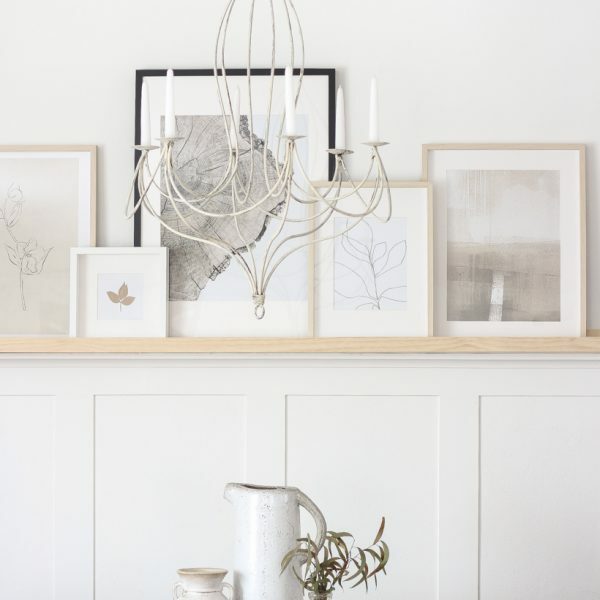 love your new light fixture, too. MY GOSH . What a great change you have made to your porch , It really looks nice. I love the big numbers!!! This turned out so well!! I absolutely love the planters. I just moved into a new house and have been wanting a fun project. Your whole porch looks beautiful. Your site does for that matter. So much inspiration for me here. Thank you for the specifics on what worked and didn’t on the planter plans. I may do something like this on my porch. We get a lot of wind, so I like the big sturdy planters. I found you on the link party at Whipperberry. Very clever, looks so welcoming. This looks beautiful Liz! 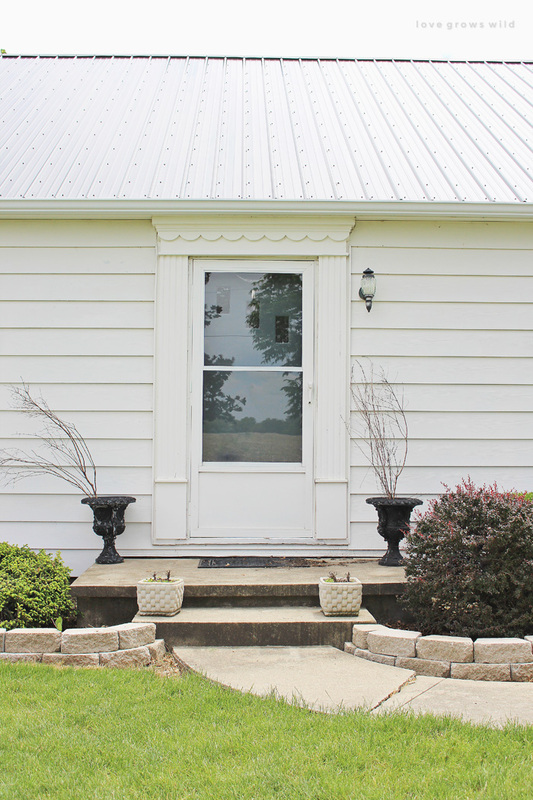 I am working on a front porch makeover myself and I hope mine turns out as nice as yours!